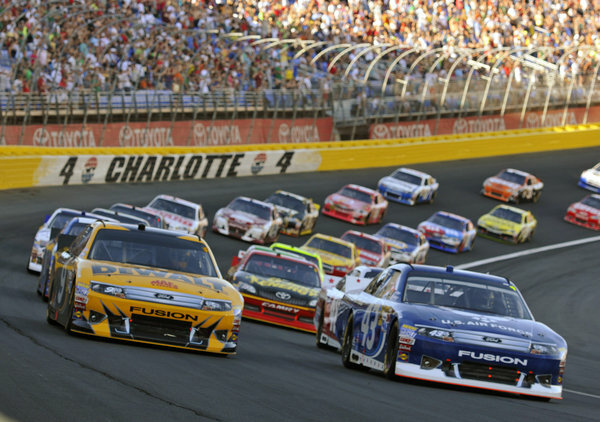 The second off-weekend for the Sprint Cup Series comes at a critical time, as the countdown to the 2012 Chase is in full swing. On a weekend where the stars of NASCAR get to take a break, it’s also the time for many to get set for changes in the final stretch run. Many teams find this is the time to turn up the heat and make their run to the Chase. Teams that are in the top-10 are looking to hold their spot, or at least get a few more wins to secure a higher spot once the standings are reset after Richmond. At the same time, the battle to get the two wild card spots is still as intense as ever, and more drivers are in it to make it than last year. By the time Bristol passed by, everyone knew who would have one of those spots, as Brad Keselowski continued his strong summer by getting his third win, and ultimately securing the one spot. This year, things are much different…and much more critical. Before I go into the wild cards, let me explain what they are. The top-10 in the standings after Richmond are automatically in the Chase, and are reseeded based on wins. The final two spots are filled by the two drivers with the most wins that are in positions 11-20 in the standings. So, one driver could have four wins, but could be in 21st and miss the Chase because of some bad luck at the beginning of the season. Here are your current wild card drivers: Kasey Kahne and Kyle Busch. Right now, it appears Kahne is in a safe situation because he was the most recent winner on the circuit, and that was his second win of the season (Charlotte and New Hampshire). Two wins are usually a good bet that he will be in the Chase, and could break into the top-10 if he gets momentum. However, Busch is not in as good a position as Kahne. Busch only has one win thus far, but has experienced some bad luck over the summer, mainly being engine failures. That has taken him into the position of being in the hunt for a wild card spot. This makes it critical for him to get another win or two, and there’s a few tracks that he certainly can win at. But, at the same time there’s a few drivers with one win also that want to secure their spot in the title hunt. The other two drivers in the top-20 with a win are Joey Logano and Ryan Newman, both in contract years with their respective teams. Either one has the potential to get another win on the season, but time is running out. Meanwhile, there’s a few drivers with no wins thus far that are in position to either break into the top-10 or try and steal away one of those wild card spots. I’m speaking mainly of Carl Edwards and Jeff Gordon, two drivers who are having rather dismal seasons. Edwards has not won since Las Vegas last year, but finished second in the standings. Now, he’s in 11th with no wins, and now must continue on this year with a new crew chief. Maybe it will create some needed sparks to light up the entire No. 99 team, but that won’t be determined until action resumes. As for Gordon, if bad luck is something that can be bought, he’d have a full supply. Flat tires, blown motors, loose wheels, and anything more that could keep him from victory lane has happened. Yet, at the same time, the confidence he has in his team still remains, and Hendrick Motorsports has not rushed to make any changes to the team, or even considered making changes. The reason being is because all that’s happened is out of their control, so why make changes when no one is at fault. There’s still time for Gordon to get to victory lane, just like Edwards. But time is running out. Seven races remain before the 2012 Chase kicks off at Chicagoland Speedway. Without question, these last seven races before the Chase will be interesting, beginning next weekend at the Indianapolis Motor Speedway. Tune in to ESPN at Noon ET for the Crown Royal Presents the Curtiss Shaver 400 at the Brickyard to see if the standings take major changes, or if the favorites once again come to the head of the pack.